Map Kibera did not begin as a participatory development project. The initial project was an attempt to introduce open source technology – namely, OpenStreetMap – into a community that had previously not had a publicly accessible map (for all intents and purposes it was “unmapped”). Initial mapping of Kibera was done quickly (in 3 weeks) and local leaders, including administration were consulted but not necessarily engaged in the process. Interest from the international community and the innovative nature of the project fueled its expansion and the local community was left behind. The entire Map Kibera team has been reflecting on these experiences, individually and as a group, over the last couple of months (read Mikel’s reflection here). In November 2010, Map Kibera became a research subject. Our initial thoughts were that the research would take away from our work because we would need to give a significant amount of time to focus groups and workshops during a busy time of the year. We were however pleasantly surprised – being subjects of the participatory research process was an invaluable learning experience. We were all able to take time to reflect on the work we had done and consider where the strengths and weaknesses lie. The evaluation of the project – recently shared with us by Samuel Musyoki of Plan Kenya (formerly of Institute of Development Studies (IDS) at University of Sussex) and Mark Skipper of Aptivate – is an important read for anybody interested in ICT4D. Our experience in community engagement has evolved since the early days of the project, particularly because of the team we’ve been working with at IDS. Map Mathare is a 4 month training programme in Mathare led by the Map Kibera team. Building on the experiences in Kibera, we hoped to improve the process of community engagement and enhance our skills in participatory storytelling. With advice and leadership from staff at Plan Kenya, we embarked on a journey of community participation in mapping and media. 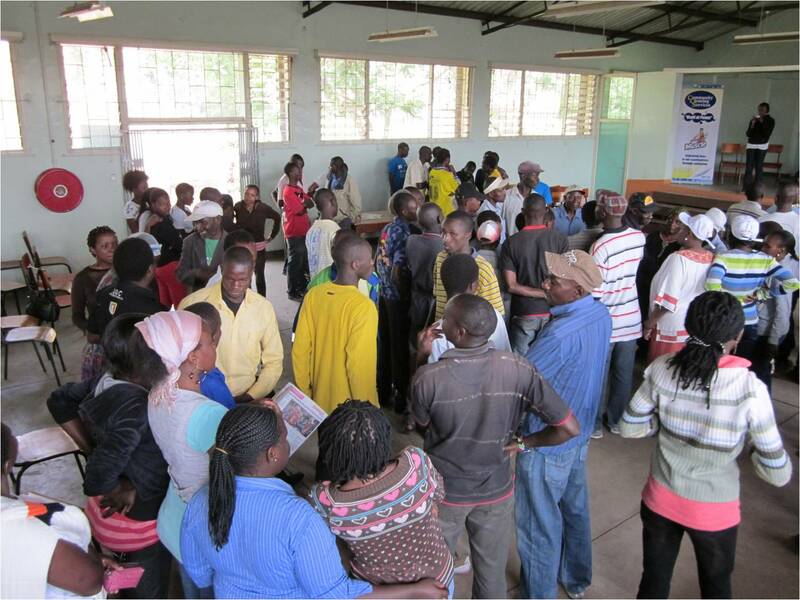 By employing an explicitly participatory methodology, we hope to improve community awareness and impact and reach our main target audience – the people of Mathare. Our first step was to cross the city (not as easy as it sounds with the Nairobi traffic!) and meet with local youth groups in Mathare. Why? To see if the concept of Map Mathare was of interest to them. Without any interest from the community, we wouldn’t and couldn’t move forward. We had an inclination that there would be support for the concept because we had received a number of invitations to visit Mathare and perhaps start some work there. COOPI, Rebel Film board and Community Cleaning Services all extended invitations separately and we met with their members, who were all excited about the work. We also met with Onserio, the District Officer of Mathare. He was also enthusiastic about the project and began brainstorming ways in which his office could use the information. We continually received calls from Mathare residents who we had met (our first trip there was July) until the day we started on December 1st, 2010. As a colleague recently pointed out, the first important difference between the work in Mathare and Kibera is that Mathare was demand driven, while in Kibera the work was supply driven. Our second task was to meet and plan the Mathare approach. This was only possible by working closely experienced staff and local leaders, such as Simon Kokoyo – a community development worker with 20 years of experience in Mathare – and Plan Kenya with Community Cleaning Service staff (CCS) – CCS is Plan Kenya’s local partner with experience in facilitating participatory community sanitation work. Of course during this step we secured funding for the project, through a contract with Plan Kenya that is supported DFID (Plan UK) and AusAid (Plan Australia). We also met with the local administration in the area, to ensure support for the mapping process. Our third step was to formally introduce participatory teaching methods to our Kibera teams. For three days in November, we invaded the NaiLab and were guided through some practical examples and theoretical principles behind inquiry lead learning (ILL). The ILL workshop was facilitated by Mark Skipper from Aptivate. Mark’s challenge, which turns out to be our current challenge in Mathare, was to design a participatory learning experience for 30 young people over 3 days. Of course, his first response was “it can’t be done”. To provide a transformative learning experience, he needed a smaller group. This was not possible we decided – as we had invested countless hours in team-building between the three Map Kibera programmes and were not willing to compromise on who could and couldn’t participate. Mark lived up to the challenge and we thoroughly enjoyed the ILL workshop. As both a part-time active participant and part-time observer over the three days, I learned that previous workshops we have facilitated have indeed provided hands on participatory and inquiry-led learning experiences. This is mainly because you can’t learn how to use a computer or a GPS or the Ushahidi platform or a flip camera without getting your hands on one and doing it yourself! The workshops and the process were not however participatory in terms of attendance. We’ve had mostly youth attend our sessions and involved in mapping and media work. 1) To build participation into the process, encouraging involvement from stakeholders at all levels – women, men, elders, youth, local administration, local elders, you name it! After the IIL workshop, and many more planning meetings, our fourth step was to get out into the community and discuss the idea with everyone! This was done through a community forum, which was held at St. Teresa’s church on December 1st. The turnout was great! 118 people signed the obligatory “sign-in sheet”, while many did not. We estimate the true number to be about 130. Our budget for tea and lunch was shot because there were so many people! 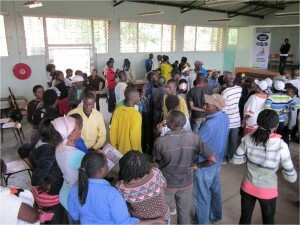 The Kibera team presented their work and the Mathare residents discussed the importance of new technology. The group engaged in a “map with your feet” exercise to explore the importance of mapping community resources. The community forum brought together elders and youth, who identified challenges they are facing including unemployment, tension between local administration and youth, crime, corruption, etc. The general mood of the forum was positive and the attendees were excited to learn from the youth of Kibera. The week after the community forum we began training. Day 1 – we had 45 attendees. Maureen (a mapper), Joe (from KNN) and Fred (from Voice of Kibera) presented their programmes and discussed the importance of the work they are doing. Primoz presented the theory and concepts behind geographic data. Day 1 complete. As we move forward, the planning team decided we need to improve the learning experience by making (somewhat smaller) groups. We didn’t (and still don’t) want to turn anyone away, because from the perspective of community participation – the more the merrier! We want to generate and sustain support for this programme from within Mathare. The map needs to be the generated by and for the people of Mathare. But how do you effectively train 80+ people? We had initially planned and thus budgeted to train 40 people! Note: of the 84 participants that came through the training programme in December 2010, the average age was 26.2, with a range of 17 -43 years. This post is part of a series exploring the ideas and issues that have emerged in our research project with Institute of Development Studies, supported by DFID. All posts from the Map Kibera team, the researchers from IDS, our trainers and colleagues are collected here. As always, we are eager to discuss this work, so we hope to hear your comments. Greetings from London. Jamie this is a great post. It is amazing how far this has come. I hope the thematic mapping is coming together well too. I am yarning for more after the brief updtaes last week. I have included some of the links you shared in my UCLTS blog and the globla CLST pages. Linda good to see you are keeping track on this. Will be great to see you during the PLA writeshop in Nairobi.Jamie, primoz, MK and MM keep the good work. This makes a great read. Good to see that the participatory action research has provided great learning and that you can see improvements in Mathare. I am sure the lessons emerging here can be ploughed back to Kibera too. Excellent and keep it up. Thanks Sammy. We really enjoyed working and learning from practitioners of participatory action research! Thanks for your support. We’re undergoing a process of reflection and planning to bring some of the lessons back to Kibera. This is great insight and methodology we should all be using. Might I republish this post with attribution to you and a link back on http://ictworks.org to spread your thoughts even father? Thanks for the positive feedback. We’re blogging our experience for exactly that reason – we would be happy for people to learn from what we are doing and use the lessons learned when implementing similar initiatives. Please go ahead and re-post the information on ICT works – with appropriate links and attribution of course! You are currently reading Whose map? at Map Kibera.